she won't free me from her snares. So after two months of watching the tower get taller and the people inside it get fatter, the Vikings came up with a very Viking plan: fill the river with dead bodies so they could attack from every side. 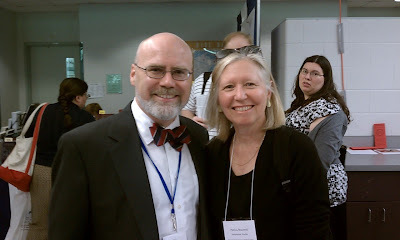 We were really, really busy at the Medieval Congress at Kalamazoo today. We had a lot of people who were just curious, a lot who wanted us to save their journals (which we will), and a lot who had monographs to pitch. 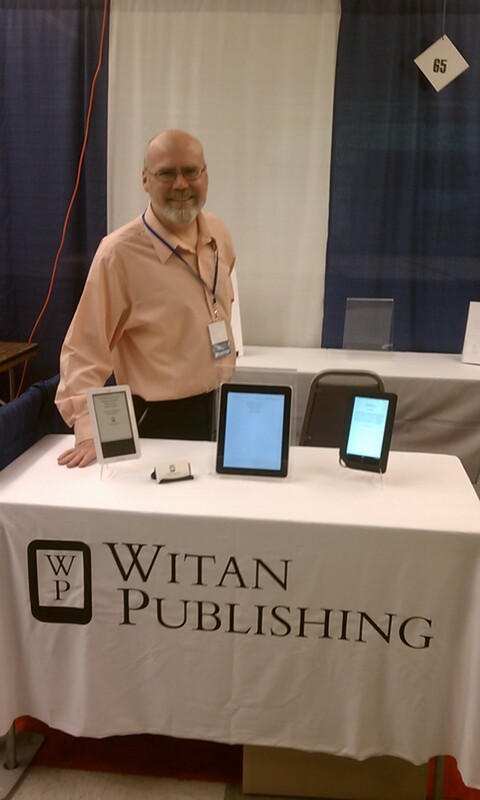 So, let me take this time to honor an early adopter of Witan Publishing, Larry Swain. 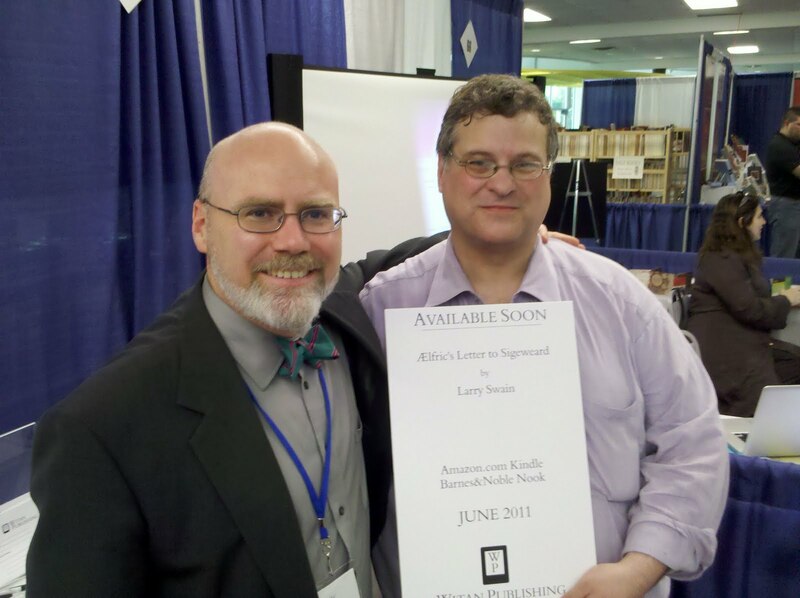 Larry's book should be out in June (pending editing stuff), so he's on the cutting edge of academic publishing. He's got a really fine edition of Aelfric's Letter to Sigeweard we can't wait to make available. Larry with the sign promoting his book. More promotions to come online! We're doing brisk traffic here at the Witan Publishing book at Kalamazoo, and one of the nice things about being set in a central location is that I'm getting to meet everyone I know. In addition to seeing old friends, I'm meeting new. I just met historical fiction author Patricia Bracewell, who is currently working on a book entitled Royal Hostage about Emma of Normandy. Patricia Bracewell and me ... and some poor woman accidentally photobombing us. Amazon.com now has a new policy that you can't post books for free -- which really stinks because we intended to offer our sample book for free starting this week. So, in the meantime, you can still buy "Old English and Samwise Gamgee's Genealogy" on both Amazon and Barnes & Noble, but it'll cost you a dollar. We're now going to try a work-around to allow the slightly more tech-savvy to download it for free on our website, but that's not quite available yet. If you don't want to pay and don't want to wait, just come by our booth -- we'd be delighted to show it to you for free, without Amazon or B&N getting their cut. Today I arrived at the Congress in Kalamazoo to set up the Witan Publishing booth. Now that I'm seeing in from the other side, I'm finding that the already helpful staff is really helpful for exhibitors. As usual it was great seeing Lisa Carnell, and Theresa Whitaker made sure everything was perfect. I'm really hoping we're able to help a lot of people during this conference. Lots of journals are struggling financially, and we offer the ability to publish for free, distribute world-wide, and even make a little profit for the sponsoring organization. If I have my way, Witan will save a lot of scholarship that would find an audience if it only had an outlet. Also, this is a great opportunity for all of you who have technical questions and want them answered to go straight to the source. Michael, our Tech-Sorcerer, and Nina, our Technical Editor Extraordinaire, will both be there to answer the questions I can't. For those who worry that print culture may be entirely dead, fear not -- I for one plan to spend entirely too much money at the other publishers' booths. The Witan team is on the move! It feels weird to be going to the Congress as an exhibitor rather than a presenter. 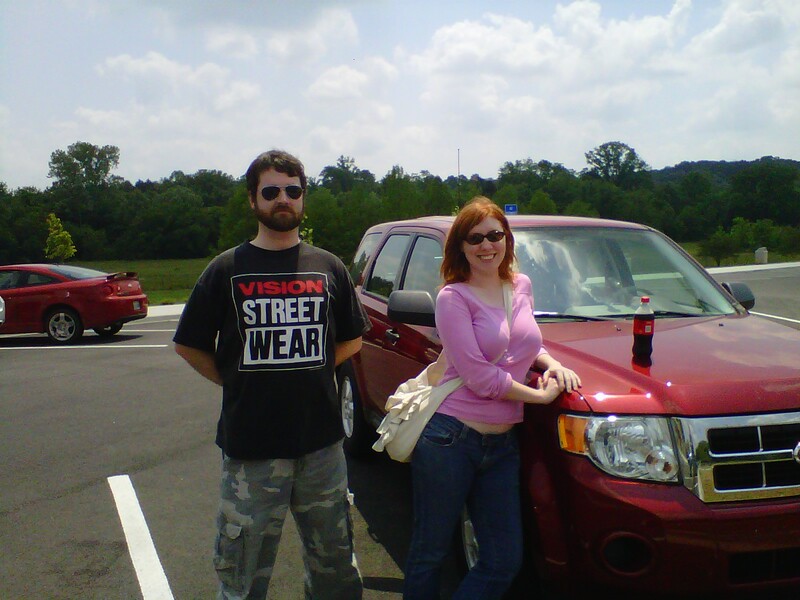 Here are two members of our team at a rest area in Tennessee. Only about 500 more miles to go! Look at the anticipation on Michael & Nina's faces! Medievalists.net has posted a really handy guide to the International Congress on Medieval Studies. If you've never been, check out their stuff. I'll be there, of course. This year Witan Publishing will have a booth, and the heads of our technical team are coming, so all those thorny techy questions you all want to know about how we make e-publishing work you can ask them. Don't ask me the technical questions; I don't know. After I'm done with the academic side of editing, I assume they turn it into an actual e-pub book using the magic of leprechauns or something. It's also a good chance to pitch your book idea to us, or sign up to be a peer reviewer, or just sign up to be on our mailing list. Or, if you don't want to do any of that, it's a good place to come arrange to eat with us at Bilbo's! A word to the wise: many an important deal in medieval studies has been made at Bilbo's -- and what better place?